As anyone in the horse industry will testify, your team and supporters play a key part in your success, and while some of you may be familiar with our dedicated grooms and those working behind the scenes, we haven’t yet introduced you to some of our fabulous sponsors. There’s no doubt that Coneygree’s fairy tale win in the Cheltenham Gold Cup put the Mark Bradstock team in the limelight (recent coverage includes a fabulous piece on Coneygree in Horse & Hound, issued 24th September – have you seen it?) and we are delighted to welcome some new sponsors to the team who are helping us to realise our future ambitions. We have been using Dodson and Horrell feeds for some time and are thrilled to be supported by them. Racehorses are fussy eaters and their appetite can decrease with fitness so we were keen to find a feed that combines palatability with essential nutrition. We first moved to Dodson and Horrell because Coneygree was turning his nose up at other brands but fortunately, we’ve found a feed that he loves. They have a great range of horse feeds from convalescent or pasture mix to racing diet, but what I am most impressed with is that the mangers of all our horses are almost always licked clean! Another sponsor that we are delighted to welcome on board is Premier Equine. I will admit to joining many other horse lovers in being a bit of a rug addict. The perfect rug is hard-wearing, warm and breathable and it is surprising how difficult it is to get this exactly right. 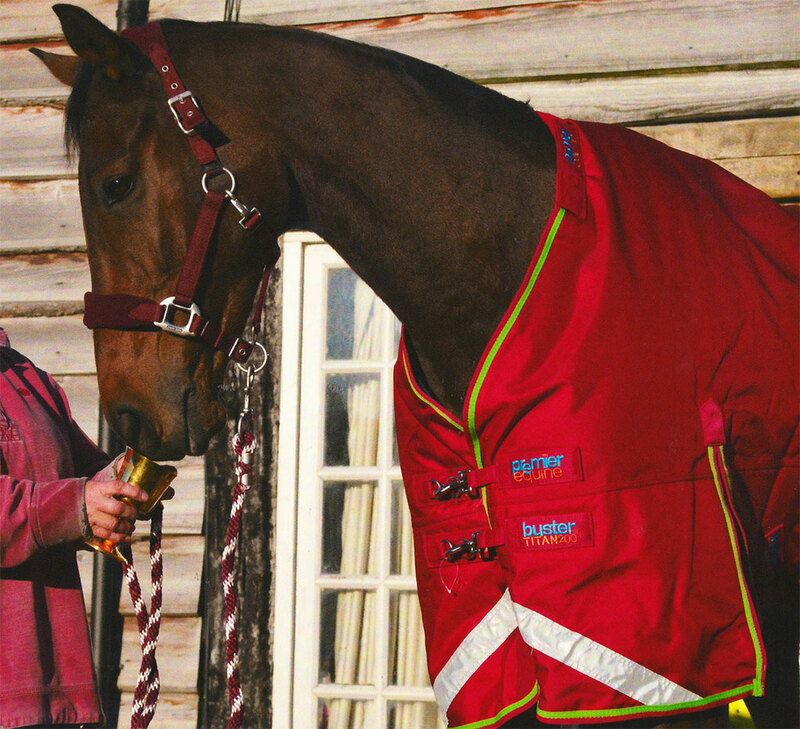 I am particularly pleased to say that Premier Equine has agreed to supply Coneygree with a range of rugs to ensure his wonderfully athletic body is always kept at the perfect temperature (and believe me, this can be a tough task with some Thoroughbreds!). Smart and effective, Premier Equine is definitely one of my favourite equestrian brands and we are also using their boots, to great effect, on the horses that need them. They have a variety of sports and brushing boots featuring innovative materials and designs and have become pioneers in protection and injury prevention. Our third new sponsor is Keyflow. Anyone who knows me can vouch for the fact that Carruthers has a special place in my heart. There was a frightening time a couple of years ago when he was diagnosed with Palmar Osteochodrial Disease in a front fetlock joint. This is veterinary terminology for a bad case of wear and tear where the shin bone meets the joint and things did not look good for his long-term prognosis. However, on veterinary advice we started to feed him a product called BoneKare made by Keyflow, which is a vet only supplement that supplies the most bioavailable type of Vitamin K.
Vitamin K has long been recognised for its function in the activation of blood clotting proteins but recent research has led to it being used in humans to treat osteoporosis, atherosclerosis and osteoarthritis. There has also been an increasing amount of research done on vitamin K’s effect on equine bone metabolism leading to the development of BoneKare and BoneKare Sport. Feeding this supplement has allowed Carruthers to regain the thread of his racing career and win several more races. We are extremely happy to be forming a relationship with Cam Price of Keyflow feeds and now feed BoneKare and BoneKare Sport to all of our horses. Last but a long way from least, we will always be unbelievably grateful to our main sponsor of the yard, equimedia, who were kind enough to supply us with a vital horsebox when we needed one. Louise and Andrew Burgess, owners of the company, are our loyal and generous supporters, and have given us invaluable help in creating this website. equimedia was recently ranked the second largest UK independent digital media agency, so we know we are in expert hands! We are always interested to hear from potential sponsors who would like to be part of the friendly and ambitious Mark Bradstock team. Training racehorses is a full-time operation and the costs can quickly mount up. We’re lucky to have a fantastic base and facilities, but as we look towards the winter, we would like to improve our all-weather surface on the gallops, so that the horses can continue to do fast work on the best surface, regardless of the weather conditions. If you would be interested in helping us to achieve this next objective through sponsorship or expertise, then please do get in touch.